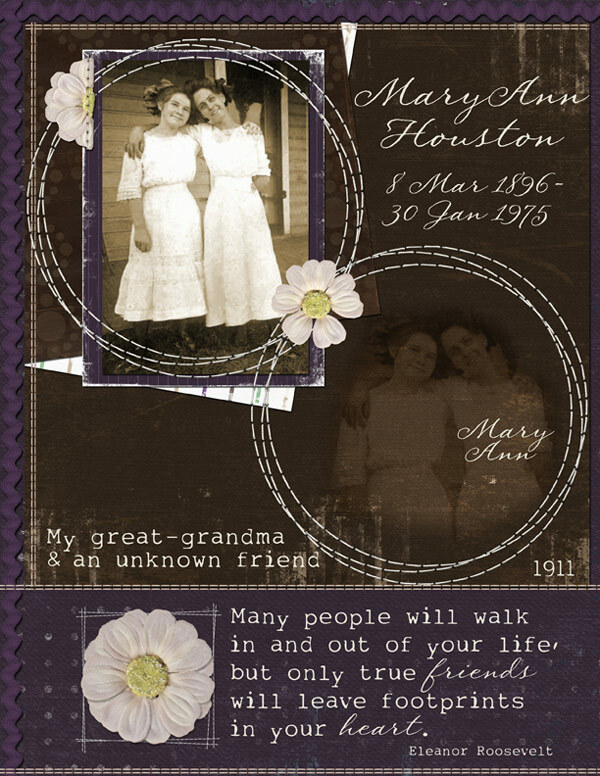 This is my great grandma Mary Ann Houston Scott and according to the back of the picture “an unknown friend.” She was only 15 years old at the time, but I still feel bad that no one knows who the other girl was. Her family was probably living in Woods Co., Oklahoma at that time. This is a layout I made from another layout. I recycled my layout to get it to fit my needs! 😀 The large layout is for the monthly quick page exchange we do at ScrapMatters. This month the kit was Brown Eyed Girl by Britt-ish Designs it was so fun to scrap with. A quick page exchange is so fun, first you make a scrapbook layout and then you take away all of the writing and titles from the page. Then you crop out the part of the page that has the picture in it leaving an image like the one above. There are more detailed instructions at ScrapMatters–links below. The white rectangle is actually transparent and you can just slip your photo under the page. Then just add journaling and a title and you’re finished! You can find more information about the quick page exchange here and the kit here. Watch for a Christmas themed Quick Page Exchange coming soon!